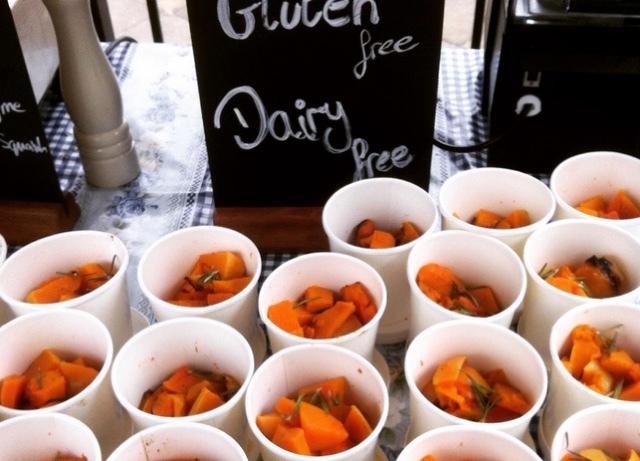 Welcome to our series on gluten-free eating and drinking in London, highlighting London’s best gluten-free restaurants, bars, pubs and food shops. It’s thought that 1 in 100 people in the UK have coeliac disease. Given London has well over eight million inhabitants, a bit of basic maths suggests around 80,000 people in the city fall into this category. Add on all those who have other gluten allergies and intolerances, and that’s a lot of demand for gluten-free food and drink — yet it’s not as prevalent as it should be. Eating from airstreams, stalls and vintage vans is a huge part of the London food scene, but at first glance, appears to be hell for anyone who can’t eat gluten. Brioche bun burgers, gourmet mac and cheese, hand raised pies, Vietnamese banh mi, artisan sourdough pizzas — the list goes on. 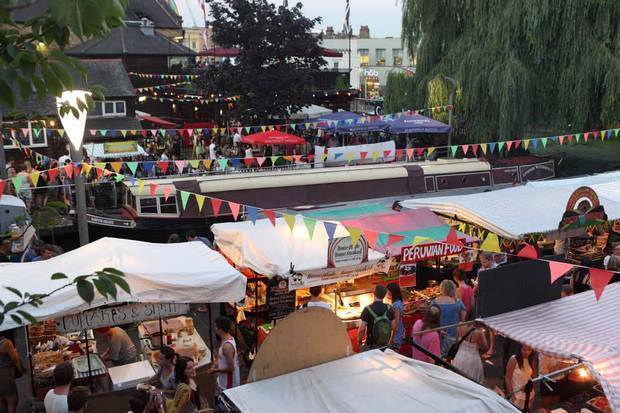 But the market is evolving; take a closer look and you will discover a world of clean, allergen savvy food artisans and producers who make some of the best street food in the capital. Most street food vendors rotate their locations pretty randomly; part of the fun is finding them. They also regularly change their menu too. 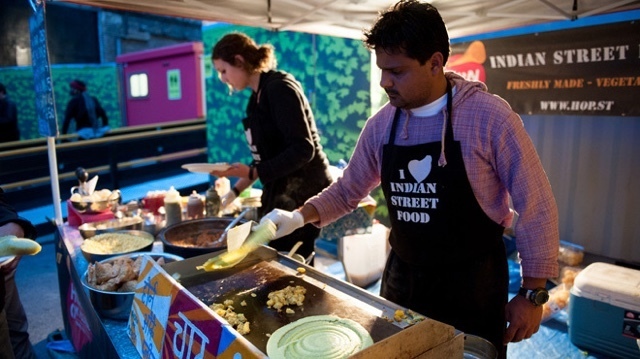 It’s the very nature of street food – exciting, unpredictable and unique. So when heading out to get your fix it pays to be organised: follow food vendors on Twitter and Facebook, where many will post their menus, specials, new stuff and upcoming locations. And do talk to them. The beauty of this kind of food is that very often those cooking your dinner will be the passionate business owners themselves and will be happy to chat about their grub. The lack of a formal restaurant environment also means there are no rules. Bring your own roll, make up your own combo, eat from three different stalls: it’s all for the taking. The listings below are grouped by market to highlight the multiple offerings at each location, but many of the traders also appear at different markets — look them up. Organic French galettes authentically made from just buckwheat, sea salt and water, in a 1979 Renault truck. Simple well-sourced ingredients such as comté cheese and cured ham are cooked on a separate griddle to the crêpes. Try the 'brunch complete’ with egg, the 'sweet one' with salted caramel or their seasonal special. Masters of naturally gluten-free dosa — a fermented rice and lentil pancake from South India — this husband and wife team pack each one with spiced paneer and own-made chutneys. Topped with the crunchy Bombay snack bhel puri, and traditional coconut chutney, they're also vegetarian. Also try: ultra-seasonal, artisan ice cream from Ruby Violet’s vintage ice cream van. 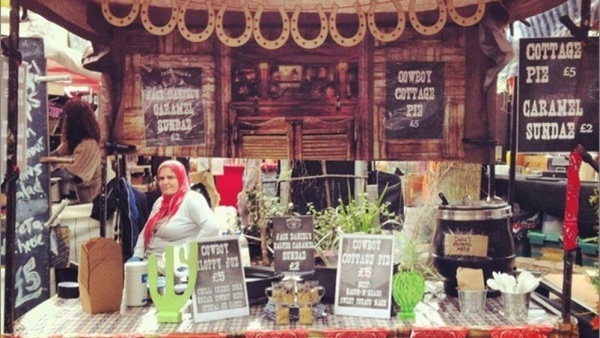 Roaming street food collective, find them regularly in King's Cross, Spitalfields and at the Gherkin. Check locations and traders on their website. 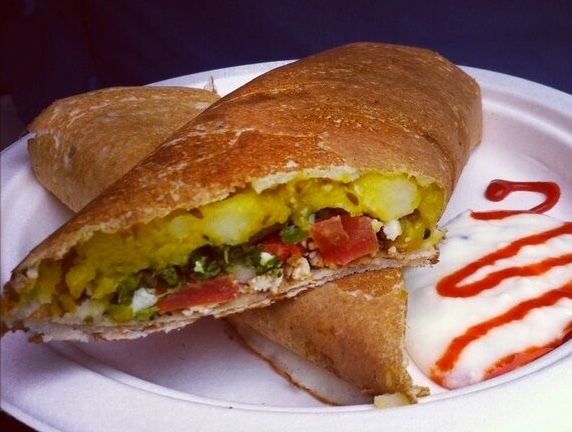 Representing true Indian street food, these two friends serve up traditional moong dal dosa (fermented rice and lentil pancake) filled with masala potatoes, folded then topped with spiced chickpeas, crunchy chickpea noodles called sev, and fresh pomegranate. They also offer other Indian street food classics such as popular Delhi snack aloo tikki (potato patties), crunchy, punchy Bombay bhel puri, and — at some markets — masala chai. Also find them at Borough Market and Southbank Centre Market. Reviving old British favourites while suitably dressed in tweeds, these three friends champion the best of British food. A signature dish of naturally gluten-free kedgeree made using traditional Grimbsy smoked haddock and Cotswold Legbar hens' eggs make for a fantastic brunch. Ask for other gluten-free options from their changing menu. This stall serves up tacos inspired by the Mexican food found in Nashville and around the world from a converted 1950s Citroën van — and it's all gluten-free. Fillings include chicken and chorizo in mole sauce, Southern-style black-eye beans and Korean barbecue pork. Also try: Batch Bakery for brownies, and BBQ Lab for sensational barbecue with lots of gluten-free options — just ask. Spiced, rich and naturally free from gluten, these traditional Ethiopian curries are packed with berbere spice and aromatic butters. They come served with vegetable and lentil side dishes — only the bread is off limits. From the highly-regarded Dalston restaurant of the same name comes this stall offering traditional Gujarati food, cooked to family recipes. Cauliflower curry, potatoes with fresh fenugreek, mung bean dhal and onion bhajia made from chickpea flour are entirely gluten-free. Everything is labelled for added reassurance. Also find them at Broadway Market. 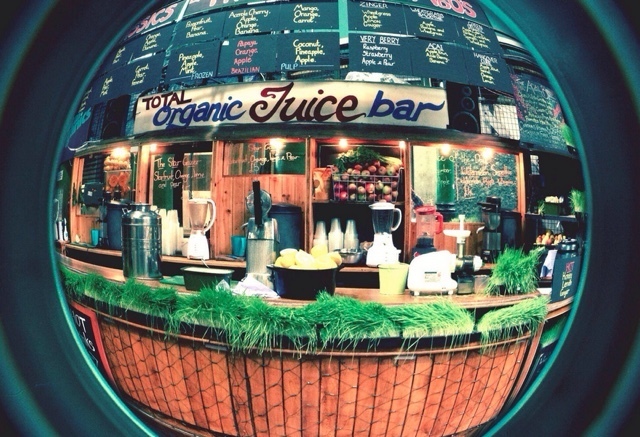 In the heart of Borough Market, this salad and juice bar can make you a bespoke salad box with a thick slice of veggie packed omelette. Pair it with a freshly-made juice and you have a health-packed lunch that is totally organic and gluten free. Also try: the epic pans of paella from Furness Fish, steak and salads from Baxter’s Brasserie, pudding from The Free From Bakehouse, or ice cream from Gelateria 3Bis which also sells Elvira’s Secret Pantry gluten-free cake. Proper Caribbean jerk chicken cooked to Mama's inherited original recipe is a fantastic gluten free-find. 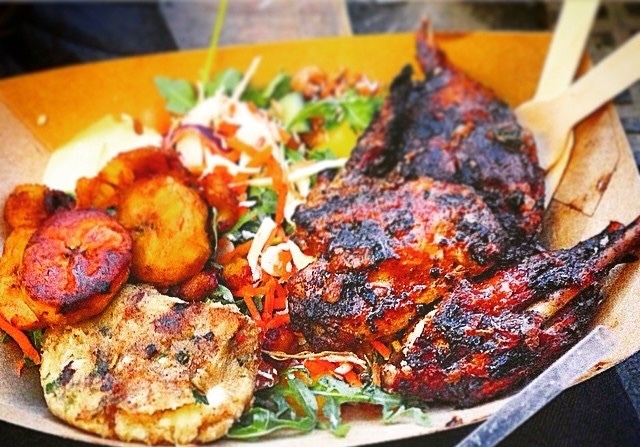 Jerk marinated chicken wings or quarter chickens are served with fried plantain, sweet potato chips, or rice and peas. Everything except the veggie and cod patties is gluten-free. Also find them at Camden Market. On this stall good value onglet — also known as the butcher's cut — is charcoal grilled and simply served with triple cooked maris piper chips. Just chose from one of the freshly homemade sauces, or for a feast try the 400g bone-in rib-eye. Also find them at Maltby Street Market. Colourful meringues are dressed up into mega puddings here — and two of those puds are gluten-free. Ultimate Eton Mess features four meringue kisses, piles of fresh British soft fruits, cream, a pipette of coulis, sprinkles and a pistachio shard. Or go for chocolate, peanut butter and banana brownie flavour with cream, fresh banana, chocolate sprinkles, a pipette of salted caramel and homemade honeycomb. Also try: Korean hot wings from Spit & Roast; peanut butter Brownies and blowtorched brownie 'kebabs' from The South East Cakery; and simple but superb ribs from Smokestak. Embracing the street food approach of taking something simple and doing it well, this stall is about cheese, bacon and potatoes layered to make tartiflette. A vegetarian version is also available. All the offerings on this Peruvian stall are gluten-free, including pork and sun-dried potatoes, warm veggie quinoa and chilli chicken. Pile up your own combo with salads and their own-made chilli sauces. Soups which are not just freshly made, but blended right before your eyes. What's more, they're all completely gluten-free. Everything except the patties is gluten-free on this traditional Caribbean food stall. This includes jerk chicken, curried goat and enormous slices of gluten-free cakes. Also try: Aki Maki's Handmade Sushi which clearly labels all allergens on a chalk board at the back of the stall. You might want to BYO tamari, though. The Pancake Man makes gluten-free galettes from 100% buckwheat and cooks them separately from the wheaty crêpes. Jacobs make gluten-free falafel, Med Paella advertise that their dishes are all gluten-free, and Rainforest Creations clearly label their healthy salad dishes for allergens. For dessert try Cru8 for raw biscuits and desserts or Fiendishly & Goode for their range of gluten-free mini-cakes. Freshly made empanadas — little Columbian folded parcels, normally a no go for gluten avoiders — are made from corn by Ruth to her own gluten-free recipe. Choose from chicken, beef or corn varieties and eat with salad, plantain chips and fresh salsa. Totally gluten-free, Sarah creates her New Orleans-inspired chicken, beef or veggie chilli using Cajun spice, jalapeño peppers and British meats. It's served either as a cottage pie topped with sweet potato mash and cheese, Chow style in a gluten-free bread bowl, or as nachos poured over corn tortilla chips — this is great gluten-free comfort food, with added peace of mind. Also try: Feed Me Primal for totally gluten free, paleo street food; Sonita’s Kitchen for naturally gluten-free Indian food; and Cupcakes & Shhht for their raw and gluten-free sweet treats.